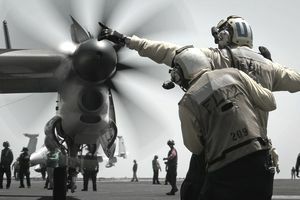 Aviation Boatswain's Mates play a major part in launching and recovering naval aircraft quickly and safely from land or ships. It includes aircraft preparation and fueling prior to takeoff and after landing, as well as fire-fighting and salvage and rescue operations. Later in their careers, ABs can earn the advanced AB rating that supervises all of the individual specialties. Supervises the movement, spotting, and securing of aircraft and equipment ashore and afloat. Performs crash rescue, fire fighting, crash removal, and damage control duties in connection with launching and recovery of aircraft. Maintains and performs organizational maintenance on hydraulic and steam catapults, barricades, arresting gear, and arresting gear engines. Operates catapult launch and arresting consoles, firing panels, water brakes, blast deflectors, and cooling panels. Most of the work in this rating is performed outdoors on the deck of aircraft carriers, in all climatic conditions, in fast-paced and often potentially hazardous environments. ABs work closely with others in aviation ratings. * For job-qualification purposes, the Navy requires a minimum total score from various sub-tests of the ASVAB. 20/100 uncorrected vision, correctable to 20/20. Must have normal hearing: Frequencies: 3000Hz 4000Hz 5000Hz 6000Hz. Average hearing threshold level in these four frequencies must be less than 30dB, with no level greater than 45dB in any one frequency. If hearing level exceeds these limits, the applicant is enlistment ineligible for the rating with no permitted exceptions. Training for ABH is on-the-job or in formal Navy schooling. Advanced technical and operational training is available in this rating during later stages of career development. Class “A” technical school is located in Pensacola, Florida. ABH training is six weeks long in aviation basic theory and basic required skills. Instruction is group-based and involves practical application of training. ABH is a sea-intensive community. Manning conditions at sea may require the need to request sea tour extension or shore tour curtailments to ensure all sea duty billets are filled. ABE - Launch and recovery of aircraft on the flight deck of an aircraft carrier. ABF - Aircraft fueling and fuel systems.